On the range, you're looking for every opportunity you can to beat out your opponent. With the Scott Advantage, you've found what you need to boost your score. Built from our most successful handle design, these tournament-focused back tension releases put all your focus where it needs to be. On aiming.. Lightweight Three finger design Adjustable moon with click Thumb peg for drawing assistance ..
On the range, you're looking for every opportunity you can to beat out your opponent. With the Scott Advantage, you've found what you need to boost your score. Built from our most successful handle design, these tournament-focused back tension releases put all your focus where it needs to be. On aiming. Lightweight Three finger design Adjustable moon with click Thumb peg for drawing assistance .. The release that has dominated the hunting industry for years One of our most durable and popular designs Forward one-piece trigger design maximizes draw length Patent-pending in-line single-caliper design Patented angled-jaw design Patented five-hole length adjustment Proprietary tooling produces a uniform smooth jaw radius. 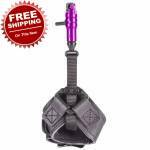 Compact, Lightweight, Single-Jaw Caliper Design Proven Roller-Sear Design for Smooth, Crisp & Consistent TriggerPull Ergonomic Head Design to Aid.. The release that has dominated the hunting industry for years One of our most durable and popular designs Forward one-piece trigger design maximizes draw length Patent-pending in-line single-caliper design Patented angled-jaw design Patented five-hole length adjustment Proprietary tooling produces a uniform smooth jaw radius. ..
Three-finger design Open ergonomic full-radius handle The answer for hunters wanting to shoot a back tension release Patented rope connector for infinite length adjustment Interchangeable thumb pegs included Buckle Realtree Xtra ..
Target-inspired multi-sear technology provides best-in-class crisp trigger feel Three and four finger extension included Fully adjustable trigger position Adjustable trigger travel Scott’s rope connector delivers infinite length adjustment for any archer Ergonomic handle .. The new Scott Quick-Shot release delivers unmatched accuracy and reliability in an affordable design. 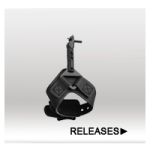 This single-jaw caliper release features our signature roller sear design for an ultra-crisp trigger activation. 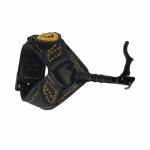 The Quick-Shot comes standard on our leather buckle strap and has a rope connector that is infinitely adjustable to fit any size archer. .. 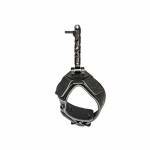 The Shark offers the smooth trigger pull of a roller sear and the double-caliper is ideal for string loop shooters. 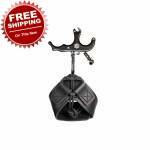 * Compact double-caliper archery release * Roller sear for the smoothest-possible trigger pull * New streamlined design * Forward knurled trigger to maximize draw length * Compact dual-jaw * Ideal for high-performance short axle-to-axle bows .. The WildCat 2 builds on the popular design of the original Scott WildCat. The same forward trigger design and Scott’s crisp Roller Sear. 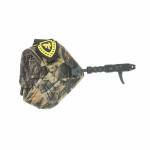 The WildCat 2 features an ergonomic head for comfort and performance when you need it most. 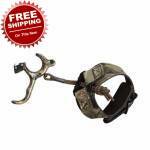 Featuring the new, cam-lock fold back connecting strap for unimpeded use of hands Stainless steel single jaw Forward Knurled Trigger design maximizes draw length and bow speeds Adjustable trigger travel Proven Scott single caliper Roller Sear design Ergonomic hea.. 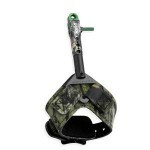 Interchangeable single or double trigger Smaller, more streamlined head design Tru-Forward Design Tru-Centering Technology Adjustable Trigger Travel Padded Leather Strap .. 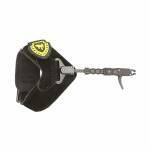 Interchangeable single or double trigger Smaller, more streamlined head design Tru-Forward Design Tru-Centering Technology Adjustable Trigger Travel Leather Strap .. 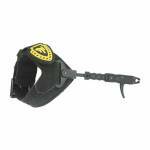 The Tru-Fire Patriot has high-strength ultra-wide no-gap jaws for quicker loading. Peg-style adjustable trigger. Jaws and trigger are heat-treated and Teflon coated. Black anodized head. 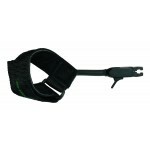 Black padded nylon Power Strap with Velcro closure. Fits either right or left hand. 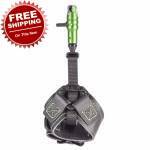 * Padded black nylon Power Strap Easy ON / Easy OFF * Fits both left and right hands * Economical great for a back-up release ..
Tru-Fire Smoke Buckle Foldback Archery Release. Ambidextrous design fits either left and right hands. It takes just 1 lb. of pressure to put the release in the stowed position and only 1 lb. of pressure to get it back to the shooting position. 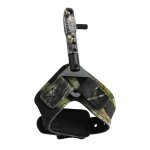 Adjustable trigger travel and dime-sized head. .. 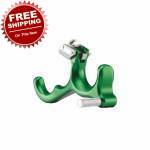 Extreme style wrist strap Locking length adjustment Adjustable trigger travel ..
Max strap Locking length adjustment with 360 rotation Adjustable trigger travel .. 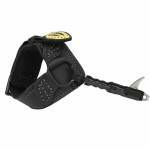 Junior version of the Smoke Extreme Extreme style wrist strap Locking length adjustment Adjustable trigger travel ..